Named for the ancient Aboriginals who roamed the vast Australian desert some 40-65,000 years ago,Tingari Ranch Retreat is a secluded yet luxurious retreat nestled in the Texas hill-country and waiting to welcome your family and friends for a truly magical escape. The Ranch consists of two large homes, the Ranch House and the Bungalow, tucked away in a private tranquil valley on an escarpment with Onion Creek meandering through its center.Together, these homes total more than 7,500 square feet of living space (sleeping up to a maximum of 30 people - 15 in each house) set in a 72 acre oasis. In addition to the chef-equipped gourmet kitchens, and well-appointed indoor spaces, the outdoor facilities include hiking trails, full size tennis court, horseshoe pit, beach volleyball court, kayaking and paddle boat when the creek is full (many months of the year - in late summer the creek level can drop if we don't get a lot of rain), a life size chess board set, a salt-water pool, and a built in fire-pit between the two houses, perfect for singing around the campfire. Wildlife is always in abundance, from a wide variety of native birds, deer and the occasional fox. Accommodations between the two houses: The Ranch House consists of three floors of living space sleeping up to 15 people: 4 large bedrooms (1 with King beds plus sofa bed, 1 with King bed plus twin and trundle, and 2 with Queen beds, a small office with a twin hide-a-bed, and a gameroom where we can set up our inflatable queen sleeper, 2.5 bathrooms, (plus outdoor shower) large kitchen dining and living areas with two story stone fireplace, top of the line appliances such as a Thermador range/oven, two flat-screen HDTVs, a large game/media room w/foosball and air-hockey, a small home gym, ping-pong table, and a huge outdoor deck with an outdoor fireplace perched 20 feet above the ground amid the treetops overlooking Onion Creek just twenty yards away. The Australian Bungalow, 50 yards from the Ranch House, sleeps up to 15 people. This single story house consists of 4 large bedrooms (2 with King beds, one with a King bed plus twin and trundle, and one with 2 bunk beds with 2 trundles), a small single bedroom with twin bed, 3 full bathrooms, large kitchen dining and living areas with a stone fireplace, a huge covered outdoor deck with outdoor fireplace and sweeping views through the trees beyond the pool to the nearby creek. 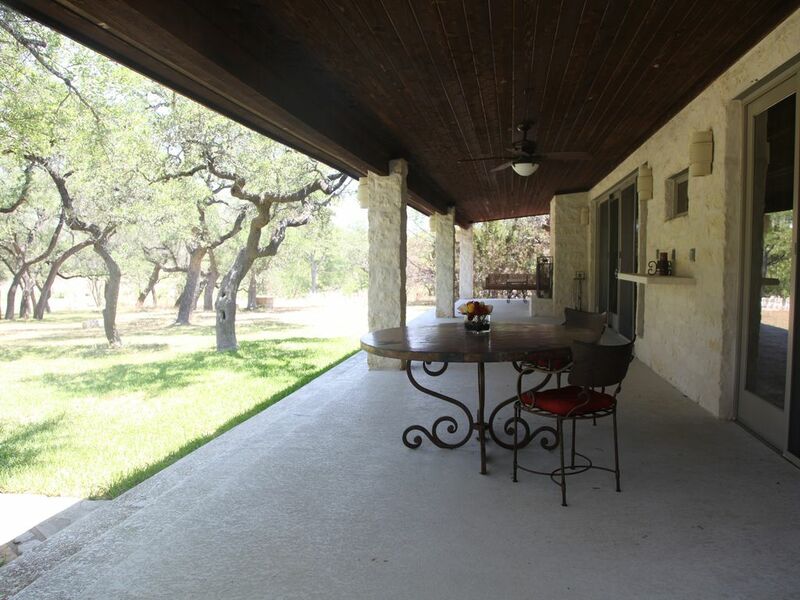 Situated in a peaceful area of the Texas Hill Country, but mere minutes away from the conveniences of Dripping Springs and Wimberley. Beautiful Onion Creek runs through the property, just yards away from both houses on the ranch. Both houses feature view of beautiful Onion Creek, which runs through the property and flows for many months out of each year. Both houses sit along Onion creek with easy access for creek side lounging in our hammocks, wildlife watching, and seasonal kayaking/paddle boating when the creek is full. Sheets and towels are provided for your stay - linen turnover not provided. (2) Washer/Dryer located in each house. Indoor and outdoor fireplaces in each house, along with a fire-pit located on the great lawn between the two houses. See wireless - internet is provided via cellular connection - can be slow at times due to rural location. bath towels provided in each bathroom, along with a number of beach towels for use at the pool kept in the Bungalow. Free weights and resistance machine provided in Ranch House gym. Basic paper goods and water coolers provided in each house. (2) Each house has a chef-equipped gourmet kitchen featuring Thermador stove and ovens, full range of cookware and small appliances. Seat 12 at dining tables in each house, plus additional seating along kitchen bar and enjoy outdoor dining on expansive covered porches at both Ranch House and Bungalow. (3) HDTV's - one in each living room and one in Ranch House game room. (3) DirecTV service to each TV on the property. Each TV has dedicated DVD player. Foosball, Air Hockey, and various board games along with HDTV and DVD player are available in the Ranch House game room - doors open onto playscape area and Great Lawn adjacent to creek. Air Hockey and foosball available in Ranch House game room. Ping Pong in Ranch House garage, various board/card games in each house. In drought conditions, creek level may drop in late summer/early fall so that boating may not be possible if water is too shallow. Salt-water pool with large area for pool volleyball net as well as a 25-yard lap lane. No events allowed on site. This property was fantastic for our family gathering of 20! The weather was perfect to enjoy all of the outdoor activities. The only complaint would be that with only 3 TV's on the property, having one of them out of order was a disappointment. Also, the refrigerator in the main kitchen stopped cooling on Saturday. The caretaker was very responsive and provided coolers and bags of ice to get us through the rest of the weekend. Thank you so much for being great guests at the Ranch. We do very much appreciate your patience with our technical issues, and glad that you all enjoyed all of the activities the ranch had to offer over your Thanksgiving stay. We do hope you'll return for future visits!! I have so many things to say about this INCREDIBLE property. We searched for months to find a place that could accommodate our group of 30 girls for a fitness retreat and Mel's home hit the mark. We were greeted by several deer and wildlife upon arrival and entered into a beautiful, clean, spacious home (the photos do not do it justice!). Both houses, the Ranch and the Bungalow, are exceptional with plenty of space for entertaining, and full kitchen/bathroom supplies. We held a kickboxing class, a yoga class, and field day in three different spots across the property. The pool is amazing and a perfect size. We also all enjoyed exploring the grounds for wildlife. The girls loved the house so much, that several wanted to skip out on our planned dinner in Austin to continue enjoying it! The location is just 7 minutes or so from a main strip, including an HEB, and only 30 minutes from downtown Austin. The location can't be beat if you're looking to get out in the country, but still be close to a big city. We look forward to hopefully holding another retreat here in 2019. Mel, we are so grateful to you for allowing us to stay on your beautiful property. We miss it already! So glad you and your group enjoyed all the ranch has to offer. Thanks for being great guests - we look forward to welcoming you all back next year! Thanks for being such wonderful guests! We are glad you enjoyed your stay at the ranch and look forward to having you back any time. We had about 27 people staying between the two houses and it was perfect. Amazing outdoor areas and enough kitchen space to cook for and feed everyone without too much trouble. The creek out back made for an awesome back drop and also had a ton of fish. We caught (and released) some very nice bass, blue gill and a couple of catfish. Deer are all over the property. I wish we had more time to fully explore the 72 acres but just the little bit we saw was perfect Texas hill country. I wish there wasn’t a burn ban during our stay because we could have loved a good fire in the fire pit but we made due with the outdoor fireplaces. I can’t recommend this property enough. Perfect place for large family or groups! The two houses were roomy and well designed for large groups..... we had extended family from all over in for the wedding and this house made for a perfect family gathering. Kids and adults enjoyed the pool, paddle boat and kayaks. Just got back home and I've had nothing but good comments from everyone on how nice this place was to stay and everyone want to go back. Fantastic property and extremely well maintained, both inside and outside. All the amenities were in great working order and there was plenty of space/ clean beds for everyone. All of the activities on the property passed the time from Basketball to Volleyball and plenty of water sports with the pool and adjacent river. The caretaker of the house even called to warn of us of an incoming storm prior to our departure. Simply put, there was nothing to say one bad word about this property. i would highly recommend this to groups and families alike. A beautiful secluded ranch just 35 minutes from Austin, nestled in an ancient valley where Tonkawa Indians camped on the banks of Onion Creek. Amid a typical Texan hill-country landscape of rolling hills, spring-fed creeks, abundant wildlife and majestic views, Tingari Ranch Retreat is just 3 miles from the small bustling town of Dripping Springs, known for generations as 'The Gateway to the Hill Country'. Dining and music can be found in Dripping Springs, including the famous Salt Lick Bar-B-Que Restaurant, and the Nutty Brown Cafe with its large outdoor live music venue. For more variety, take the 35 minute drive into downtown Austin and enjoy all that the Live Music Capital of the World has to offer. Shopping and more dining can be found up the road in Wimberley; other area attractions such as the San Marcos Outlet Malls and the LBJ ranch are also within a half-hour's drive. PLEASE NOTE: 15 guests maximum in each house. IF TRYING TO USE "BOOK IT NOW": We will send you our own personalized Rental Agreement which MUST be signed and returned within 24 hours, along with the Deposit payment made through Book It Now to secure a final booking; remaining fees are invoiced 45 days prior to check-in date.